I’ve always disliked personal non-fiction that is guarded. The author obviously has something to say, but for whatever reason doesn’t have the nerve to just put it out there – naked and vulnerable. Yet, that’s exactly what I’m going to do here. So enjoy this ambiguous blog post and hopefully you’ll be able to glean the reality behind the vague words. Now that I think about it, that intro was probably a little too dramatic. I’m not necessarily being cagey with this post; it’s just that I’m still in the moment of what I’m going through and I haven’t fully synthesized it yet to adequately convey my thoughts to you. If you’re a writer, think of this situation as being a first draft of life. To whom do you show your first draft? No one. At least I don’t. Then again, other writers’ first drafts might be more polished or more coherent than mine. That’s probably not true. If you look at my first drafts they’re pretty polished. In fact, I rely on this aspect of my writing so much that I don’t proofread as well as I should – as my longtime readers no doubt have witnessed. 😉 Anyway, I don’t typically share my first drafts, because I abhor being misunderstood, which is an easy outcome when I don’t communicate my thoughts as precisely as I can. So for now I’m going to keep the wizard behind the curtain for a little longer until I can sort everything out. Your patience with me will not go unnoticed. I consider myself a writer. I’m part of a blogger community called BlogCatalog and I joined a group for writers there. One of the members of this writers group posted a discussion thread about the criteria for calling yourself a writer. Answers ranged from utilitarian (with my offering that you could only introduce yourself as a writer if you were one professionally) to absurd (with someone arguing that anyone who writes is a writer – even if all this person writes are grocery lists). I think the answer (one the majority of people can agree on, anyway) is somewhere in between, but closer to my end of the spectrum. The reason I bring this up now is that I’ve considered myself a writer for a long time – even before I was doing it professionally. However, there have been many times in my life when I have doubted my existence as a writer. There have been dire moments when I’ve sat down to write and couldn’t summon the willpower to commit anything in words. It wasn’t that I was blocked. I simply didn’t want to write. To this day a part of me is still very black & white on this issue. It’s the romantic in me that wants to believe that the source of life for a creative person is their craft – whether it’s writing, playing music, cooking, art or what have you. It is the thing that gives meaning and purpose and rejuvenation to the creator. To not do it when you have every opportunity to do so is to not eat, not breathe, not live. You forfeit the right to call yourself a member of whatever creative field you think you’re part of. You are a charlatan pulling your seat closer to sit next to gods. Ah, what a quaint idea. These days I’m mostly softer on this issue – especially now that my day job is full of monotonous writing. The only reason I’ve launched into this train of thought is that I’ve been assaulted by inspiration lately and all I want to do is create. All of the mundane yet necessary things in my life have suddenly come into brutally sharp focus – like the day job or chores or buying groceries or eating or sleeping – and I am so achingly frustrated that I have to share my creative time with these obligations of life. 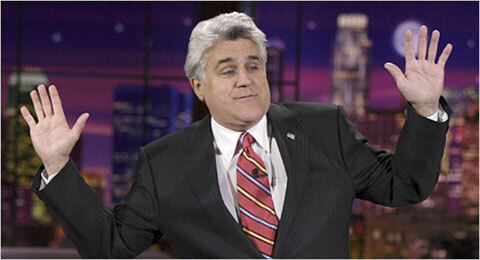 The Tonight Show with Jay Leno...Again. I have a fantastic imagination. It’s not that whatever I’m imagining is particularly unique or amazing or even worth sharing with anyone. My imagination is just very strong. Think of The Matrix. You plug yourself in and a computer program stimulates your brain into experiencing a “real” world. I can do the exact same thing organically. I can imagine myself getting interviewed on The Tonight Show and really be there, blinded by spotlights and occasionally making out faces in the audience. Admittedly, it’s a bit like the Shadowplay episode of The Twilight Zone where the guy is awaiting his execution, but it turns out it’s simply a recurring nightmare, although it feels extremely real. He spends every nightmare looking for inconsistencies with reality to prove that it’s just a dream. He tells one character that the details of the dream are the way they are because he doesn’t really know what they’re like in reality – they’re just how he remembers them from TV or something he read. So my imagination is something like that. I focus on what’s important in the scene and everything else simply has a nebulous presence in the way that nothing really exists in your real life until you focus on it. With that said, the first draft of life that I am experiencing has given me occasion to day dream myself into a seemingly absurd, impractical and implausible situation. The pull is too strong. I am consumed by the thought of this. It gives my life the immediate meaning, purpose and direction that only suicide bombers know. And because of my powerful imagination the screenplay that’s emerging from this experience is coming very easily.